This forecasted period draws upon a member of the Major Arcana, the primary grouping of cards, which contain the most powerful spiritual archetypes of the tarot deck; The Hanged Man. The Hanged Man can instill a degree of concern with clients when they see it appear in their reading spread. The name and imagery of this card may appear a bit ominous, and although clients have the tendency to want to avoid this card’s appearance, the fall of The Hanged Man, brings about a certain opportunity to investigate some aspect of life more deeply and with more intensity than may be standard. The most general meaning of The Hanged Man is life in suspension or self-imposed limitations. The Hanged Man’s appearance usually represents the presence of stagnation, interruption, or a flat refusal to move or allow flow; typically in an area of life in which there is the semblance to be more sensitive or protective. His appearance asks us to take the time to look deeply at these areas of life and dare to take the risk to place these sensitive issues into the hands of the creator, source, or the universe. There could be a request for some sense of sacrifice. However, the very expression of the willingness to place a given situation in the hands of that which is greater could be the only sacrifice required. The call for sacrifice could be a person, place, or thing to which there is a strong attachment or an issue or grouping of matters that have created a diversion of energy and created a lack of freedom, movement, and flow. 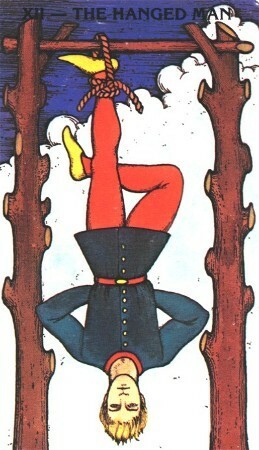 The Hanged Man reveals the power in maintaining a sense of calm, although there may appear to be a lack of movement. More flow could be present under the surface, or behind the scenes than visible at this time. Although The Hanged Man can represent the aspects of stagnation and lack of movement, it is important to remember that this is the card that precedes The Death card, which is a significant representation of change. Symbolically, it is most important to know that change is on the way. 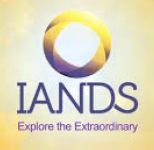 Now is an excellent time to take a deeper look at what is occupying our time and thoughts. If you are feeling stuck, or lost in the shuffle, making a declaration of the desired outcome, and trust in the process of its creation are important at this time. Opposition to a sense of stagnation, or feelings of being powerless, and lost will lead to victory as a result. Take any actions necessary to restore a sense of achievement. Sacrificing the feeling of loss, powerlessness, and being stuck will undoubtedly lead to positive results just ahead. Tarot forecasts are like reading a horoscope in the newspaper or magazine. It is an observation for the general public based on the drawing of one card for every ten-day period of the month. Check in on November 1 for the next forecast relating to November 1 – 10, 2016.